This course is intended for those studying ceramics for the first time and is a comprehensive introduction to the craft of clay working. The primary emphasis is on studio work leading to a portfolio of finished pieces by the end of the semester. In addition to demonstrations of technique and technical assignments, you should take a field trip to view historic and contemporary examples of fine ceramic art. Periodically throughout the term, I will show slides or films to help illustrate what you are learning. Introduction to clay the material... where It comes from, how It was formed, how it is gathered, early methods for forming clay objects, pinching and coiling. Introduction to the potters wheel, centering the clay, forming bowls and cylinders... trimming and burnishing on the wheel. How sculpture is made with clay, slab construction, extrusion, tile making and slip casting. Texturing and coloring clay, color used in clay and slips, engobes,. oxides and underglazes as well as non traditional decorative techniques including acrylic paint and dye. Glazing: The function of glazes and how they are made up... simple glaze testing... proper application, health and safety. Firing... Firing methods used through out history Including a primitive pit firing and oxidation firing. The main emphasis will be on your work, your growth in the medium, your ability to create expressive, unified and cohesive three dimensional forms in clay. -You will learn about clay and glaze composition and formulation. -A primary emphasis will be on handbuilt ceramic forms. You will learn to increase the scale of your work all the while keeping control over the quality, coherence and contour of your work. -You will explore a variety of hanbuilding methods including extended pinch, slab built and extruded forms. -You will learn firing and glazing methods for stoneware clay. -To appreciate ceramics from an historical perspective through study of original pieces at the Yale Art Gallery that span from neolithic times through to the present. -To appreciate how a unified, coherent form that is finely crafted is beautiful in its own right. -To understand how finishing and decorating contribute or detract from your intention as an artist. Attend all classes, care about the work you are doing in class, see it through, visit the ceramics studio between classes to move your work along, help others in the class to succeed, keep the studio clean. The final grade is based on a portfolio of fifteen vessles showing good progress in the medium. The portfolio may include wheel thrown, slab built, pinched or extended pinch, or extruded pots. Attendence is crucial. A maximum of 3 absences is allowed, with or without a valid excuse. Tradition of Honor: As a member of the Albertus Magnus College Community, each student taking this course agrees to uphold the principles of honor set forth by this community, to defend these principles against abuse or misuse and to abide by the regulations of the College. In art work, that means you have created all of your artwork. All clay, glazes and firing will be purchased for you for the class. I will provide all of the tools as well. A lab fee of $50 has been assesed on your bill to cover the cost of these materials. "Studio Potter is a magazine for the community of potters everywhere. It is written by potters and directed toward fellow-potters who earn their living by making pots...". Centering in Pottery, Poetry and Person. M.C. Richards, Middletown, CT., Wesleyan University Press, 1964, 1989..."CENTERING: that act which precedes all others on the potter's wheel..."
A Potter's Book. Bernard Leach, Faber and Faber, London, 1960 This is the definitive "classic" work which set the stage for the revival of clay craft in Europe and America. Clay and Glazes for the Potter. 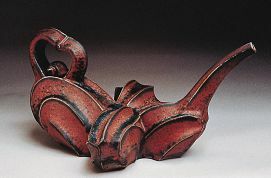 Daniel Rhodes, Radnor, PA.: Chilton, 2000, Another "classic"
WWW: The Ceramics Web - Web page devoted to ceramics, based at San Diego State University. Demonstration: Slab building Techniques Soft Slab, leather hard slab Press mould, drape mould, etc.